Preserving biodiversity in Vietnam was the main topic of discussion at a workshop on May 5 in Hanoi. The tropical margrove forest in Ca Mau Cape National Park. Nguyen Quoc Dung, from the Forest Inventory and Planning Institute under the Ministry of Agriculture and Rural Development emphasised the need for a strategic framework and action plan for the Core Environment Programme (CEP)’s phase 3 (2018-2022), building a legal framework for biodiversity corridors in Vietnam. Marine protected areas and mangroves in Vietnam are smaller than in other nations so biodiversity corridors will help develop biodiversity. “It is necessary to set up detailed projects for coastal provinces in the context of Vietnam being affected by climate change,” Dung said. 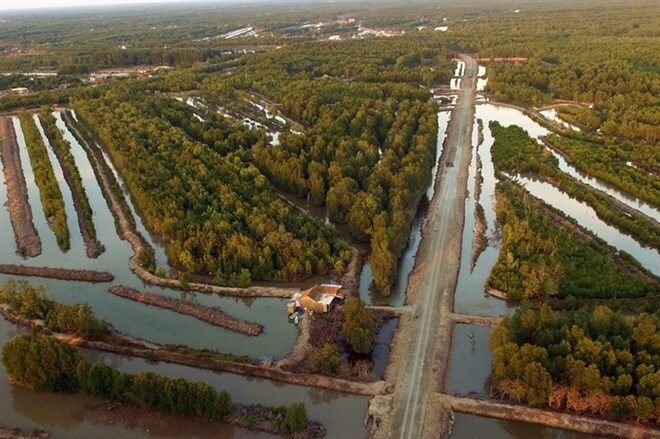 "Forests have been planted in the country to cope with climate change, with 42 projects in coastal provinces. [But]we have no national-scale project for the restoration of coastal forests and biodiversity preservation, although Vietnam has high biodiversity,” he said. Problems and disagreements between agencies on biodiversity preservation hamper the work, harming scientific research and environmental protection projects. Pham Hung Cuong, from the Vietnam Academy of Science and Technology, said developing ecosystems in remote areas owned by local people should be based on saving the native ecosystem. “Biodiversity in traditional farming must be associated with natural landscape,” he said. An expert from the Ministry of Natural Resources and Environment said a shortage of financial resources for environmental protection, limited staff capacity, ineffective international co-operation and poor State management were issues they face when building legal documents on biodiversity corridors. Sumit Pokhrel, deputy chairman of the Bangkok-based Environment Operation Centre, the unit responsible for coordinating the CEP in the region, detailed three main targets of CEP Strategic Framework and Action Plan: green growth and reducing carbon emissions, climate change adaptation and disaster risk management and biodiversity landscape and natural resources. At the workshop, Pokhrel said a great challenge was building biodiversity in all six CEP nations. CEP’s phase 3 will have four main tasks: facilitating regional collaboration and the management of natural resources; providing policy advice and technical support for member nations, supporting information management, and supplying financing and investment services. Prof. Nguyen The Chinh, director of the Institute of Strategy and Policy on Natural Resources and Environment said the Vietnamese Party and Government affirmed their commitment to addressing challenges of natural resources, the environment and climate change through promulgating many policies to ensure sustainable development. The CEP, funded mainly by Asian Development Bank, has been implemented in the six nations of the Greater Mekong Sub-region (The GMS countries are Cambodia, China, Laos, Myanmar, Thailand, and Vietnam), for ten years.